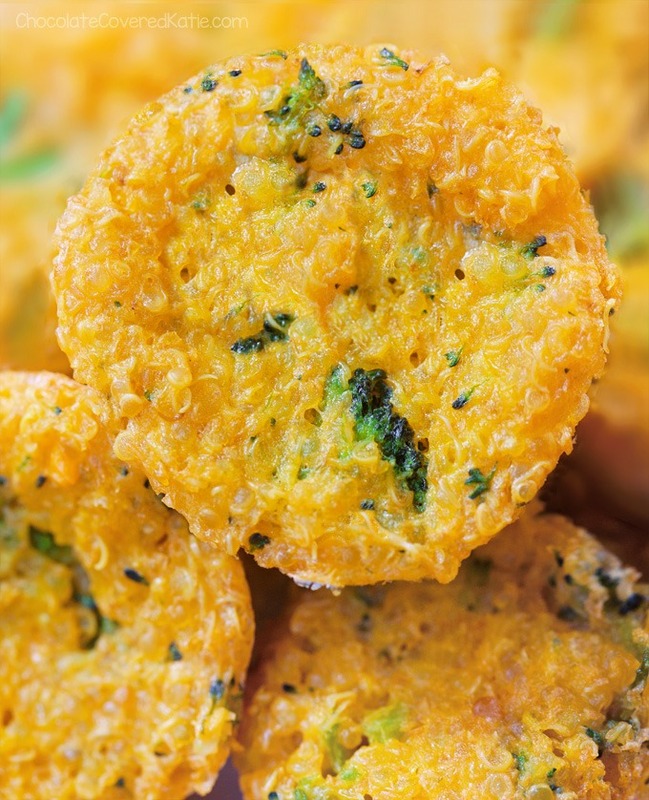 Addictively cheesy broccoli quinoa bites for any occasion – they are a super healthy snack! 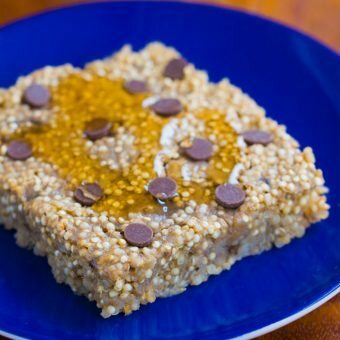 These portable broccoli quinoa bites are a great option to choose instead of sugary energy bars or processed snacks, especially if you’re the type of person who gets hungry between meals. It’s a good recipe for kids as well, because they’re fun to make, fit easily into a lunch box, or can be served as a healthy after-school snack. 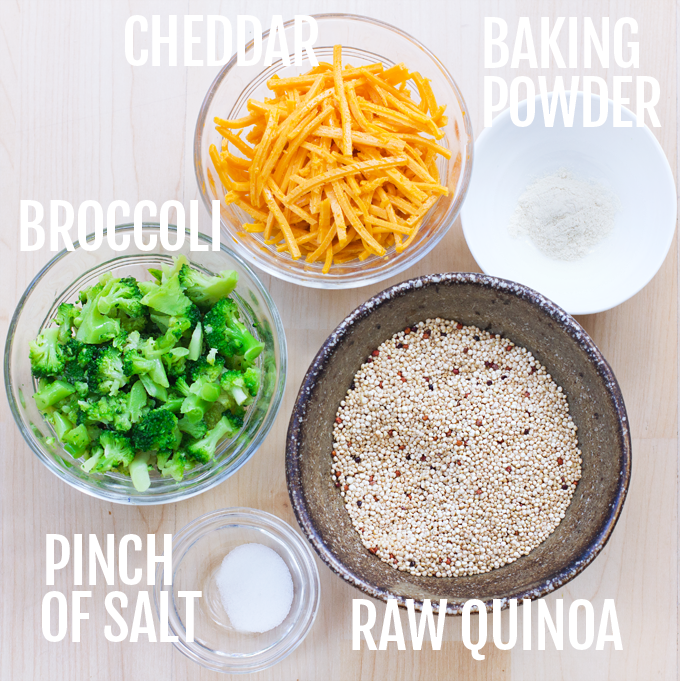 You can customize the quinoa cups to use up whatever vegetables you have on hand – try adding carrots, cauliflower, zucchini, diced red pepper or onions… the possibilities are endless! Leftovers can be frozen so you always have a healthy snack or breakfast option when you’re short on time or don’t feel like cooking, and they’re also great to pack for road trips. 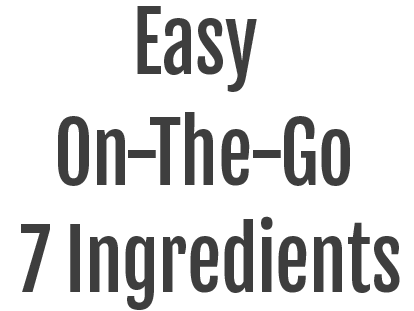 After my parents visited me this summer and were driving back to Texas, I made a batch for them to take in the car as an easy-to-eat and healthier alternative to fast food. While I’ve seen many ideas floating around Pinterest for quinoa bites, they always have eggs as one of the main ingredients. 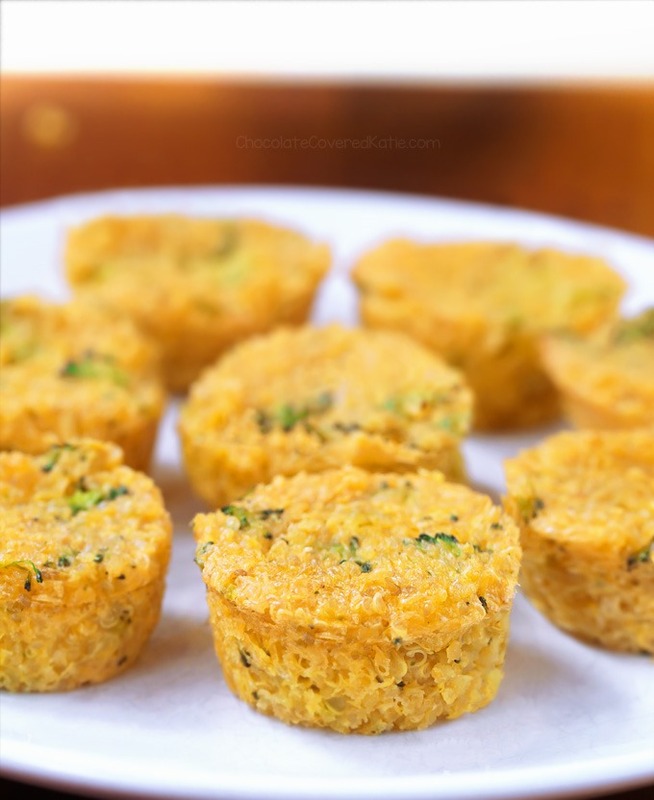 These broccoli cheddar bites are completely egg-free! Vegan cheddar works to keep them vegan (that’s actually vegan cheddar in the picture), and nutritional yeast also works in the recipe if you’d prefer not to use any cheese at all. If you make them, be sure to rate the recipe in the comments below or tag me on facebook or instagram @chocolatecoveredkatie so I can see and like your pictures! *I’ve made the recipe both as mini cups and muffin-sized cups. While both ways work, the mini bites firm up more quickly and are much easier to remove if you want to eat them the day they are made. The muffin-sized cups will peel off easily from the liners if you let them sit overnight in the fridge and reheat before eating. Line a muffin tin or grease a mini muffin tin very well. Set aside. Bring water to a boil. Add quinoa and salt, cover, and lower to a simmer. Simmer (covered) 35 minutes, then turn off heat and check on it. If quinoa is not yet light and fluffy, put the lid back on and let it sit without heat on for an additional 20 minutes. Preheat oven to 350 F. Stir all remaining ingredients into quinoa, and add salt and pepper to taste. (I like to add another 1/4 tsp salt.) Portion into the muffin tin, smoothing the tops. Bake on the center rack 22 minutes, then—never opening the oven door (important)—turn off the heat and let sit in the closed oven an additional 5 minutes. 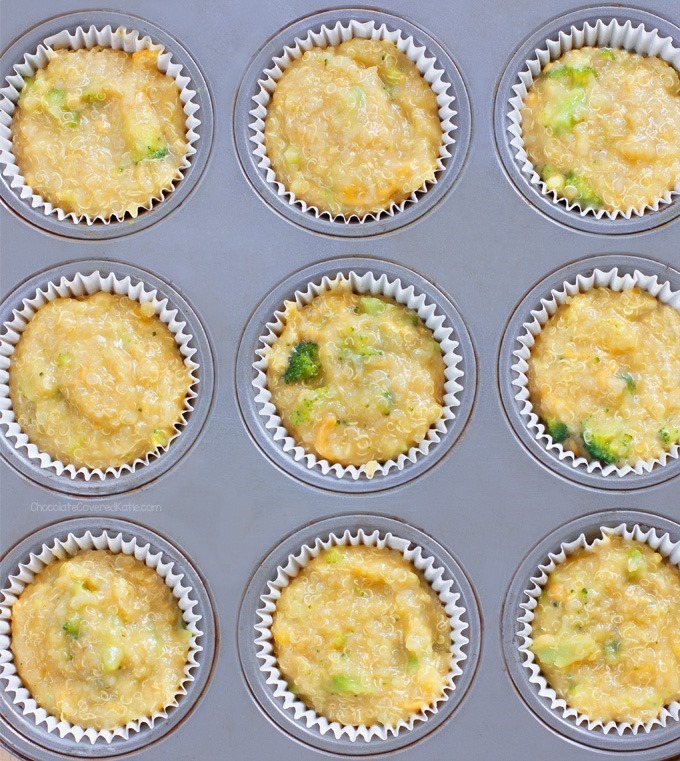 Let cool completely before going around the sides with a knife and removing from the muffin tin. Leftovers can be covered and refrigerated or even frozen for another day. I finally got around to updating the FAQ page, answering the most common questions I’m often asked by readers. Please feel free to check it out and let me know if there are any questions you think I missed! 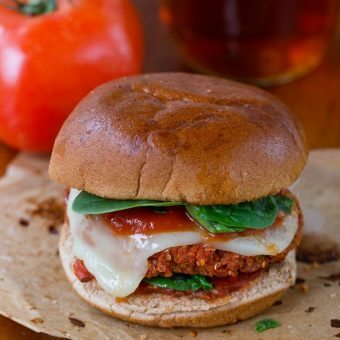 Pizza Quinoa Burgers–With Just 6 Ingredients! Is that Daiya Cheese shreds in the picture? Or do you have your own recipe for vegan cheddar? Making these tonight – yum!! 35 minutes to cook quinoa? Mine is usually done in about 15. Is that a typo? But is that on simmer? 15 minutes seems way too short. Mine only takes 15, too. Even on simmer. Maybe there’s a ‘quick’ quinoa that we’re getting? Also depends on how much water you add. How much water do you use for 1/2 a cup of raw quinoa? I do exactly what the directions say (I don’t cook it enough to go by heart), but I think it’s equal amounts water and quinoa. I’m always looking for a new way to incorporate leftover quinoa! These to-go cups would be perfect packed in my weekday lunch! Yum! I wish I was snacking on these for lunch today! I know what I’m making for dinner this week. These look delish! I am curious, what does the baking powder do? Binder instead of egg, and helps it rise. Homepage is showing chocolate biscuits..? That is so strange, but we just noticed it too. Katie is fixing it! I really want to make these! Is the broccoli raw or pre-cooked? If I want to use pre-cooked quinoa (I always have some in the freezer) how much does the recipe need? Love your recipes! That’s a really good question. I used frozen broccoli. Unfortunately I don’t know about the quinoa or if precooked from a different recipe would work the same, due to possibly different amounts of water being used to cook it. But if you want to use this recipe and make the quinoa up ahead of time and freeze it, you can definitely do that. I just made them tonight using fresh raw broccoli and it turned out perfect – though I could taste that the broccoli almost over cooked. So probably don’t use precooked, I’d say. Couldn’t resist trying these this am! Delicious! As far as the quinoa cooking time, I used prob 20 mins but added it to boiling water as per quinoa cooking instructions so maybe that’s the 35 mins. I also added an egg because of past problems with quinoa “ball” type recipes, but it’s a keeper! Delicious! 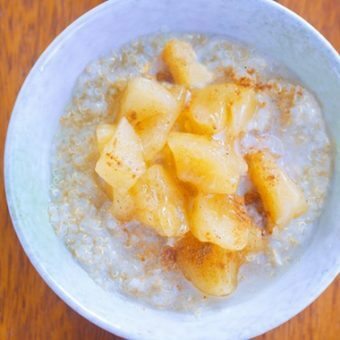 Would I be able to substitute the quinoa for bran or oats? Sorry, have never tried, but definitely feel free to experiment! I’m going to sub millet for the quinoa and add some spinach too. Looks like a very adaptable recipe! Thanks! Sounds delish! How would you sub nutritional yeast for the cheddar? Thanks! I just made these today at lunchtime. They didn’t stick together for me at all. They just fell apart. 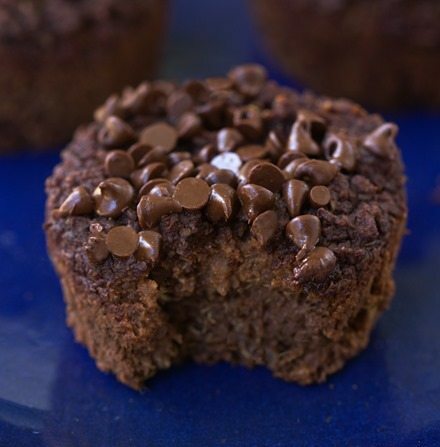 I made these in mini muffin tins. However….the recipe is delicious! I would make this again as a main course and not bother baking them into cups. Or, I would use an egg or egg substitute. My quinoa took about 15 minutes. I think it’s important to cook the quinoa the full amount of time, which would make it less wet and therefore the results would be more firm and not fall apart. I had the same experience and cooked the quinoa according to the recipe — properly cooked quinoa isn’t mushy like the video shows. That looks more like grits to me. If you cook the quinoa all the way, it’s very grainy and separated, so there’s nothing to hold these muffins together. I liked the flavor, though, so next time I will add eggs or egg whites. Hmm it sounds like you had the opposite issue then from what I guessed and that you want quinoa that is actually MORE wet than yours was. So if you try again, just don’t cook as long – time of cooking will depend greatly on your own specific stove, because different stoves will have different “low” and “simmer” heat power so unfortunately it will vary by stove. But it sounds like yours just needs to be less cooked, if that makes sense! really nice muffins! I don’t usually see any that even approach “healthy” by and definition, so these are much appreciated, so thank you! I’ve just made these and oh boy are they good! My partner and I ate 13 – oops! I used nutritional yeast as that’s what I had handy – it made the mixture much thicker and stickier than in the video, but it was kind of fun rolling it into little balls to squish into the muffin tin. The flavour was fantastic, and the bites actually shrank away from the edges of the holes, which made them so easy to remove (and taste hot fresh from the oven! Naughty haha). made these tonight and loved the flavor. i added an egg and finely sliced scallion greens. the only thing was they stuck to the muffin paper. i used zucchini. Wait a day, and after a day they will no longer stick! Made these in large muffin bites and they were delicious. Made them again using chop thawed spinach, scallions, fresh parsley and dill. Great flavor too! My guestion, how long to bake the miniature muffin cups? 22 minutes for the large but how long for the small? Thank you so much for the yummie recipes! Looks like a great recipe! 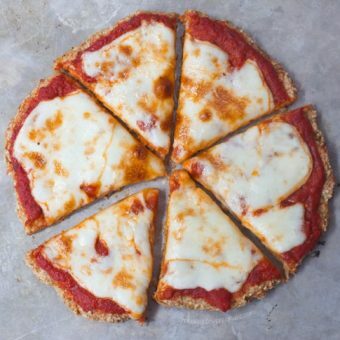 Who knew that vegan cheese could taste so good with quinoa? This is one of my fave recipes! (I use nooch.) I’m not usually a huge quinoa fan, but these are so crispy & delicious! I love them fresh, but I’ve made them for to-go snacks as well. Thanks!